Qualex-Landmark™ President Mohammed Esfahani and Deputy Mayor Evan Woolley, Councillor for Ward 8 officially opening Park Point and cutting the opening ribbon. Support by VIP guests; Qualex-Landmark™ Managing Director Cyrus Navabi, IBI Group Director Martin Bruckner and Axiom Builders Senior Vice President Mike McDonough. Park Point, the highly-anticipated luxurious highrise residential community by Qualex-Landmark, has officially opened its doors. Located in Calgary’s beltline area, the neighbourhood scored the top spot in “Calgary’s Best Neighbourhoods 2018” report. 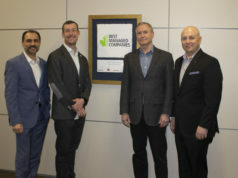 The official opening was celebrated with a ribbon-cutting ceremony and tour of the building with Deputy Mayor Evan Woolley, Qualex-Landmark president Mohammed Esfahani, Qualex-Landmark managing director Cyrus Navabi, IBI Group director Martin Bruckner and Axiom Builders senior vice president Mike McDonough. The iconic Park Point residential tower marks a new architectural masterpiece in Calgary at its prominent location on the corner of 2nd Street and 12 Avenue SW – a hot spot for exciting urban living right on the historic Central Memorial Park overlooking Memorial Park Library. Construction began in the fall of 2015 and the development has progressed on schedule, hitting every milestone in its advancement into the Calgary skyline. Designed by global architectural firm IBI Group, Park Point features 289 one-, two- and three-bedroom homes including live/work town homes. With its black-and-white facade, as cited from the park and downtown, Park Point has a strong and unique vertical architecture which resembles an exclamation point with the podium at its base as the dot. As the building rises, the floor plate grows to create a stepped effect with a colour-enhancing pattern. From street level, an elegant double-height lobby with a natural stone floor and wall tile surrounds the interior and a distinctive and inviting exterior canopy further adds to the prestige nature of the address.Located atop the tower podium on the third floor, Park Point hosts an expansive list of indoor and outdoor amenities including a Zen terrace, fire pit, barbecue and sun deck. A fully-equipped fitness facility features a Pilates studio, steam room and infrared sauna with change rooms and showers.Park Point is nestled amongst some of Calgary’s most popular and trendy venues. Residents are within walking distance of restaurants, bars, shopping and iconic locations such as the Saddledome and East Village. 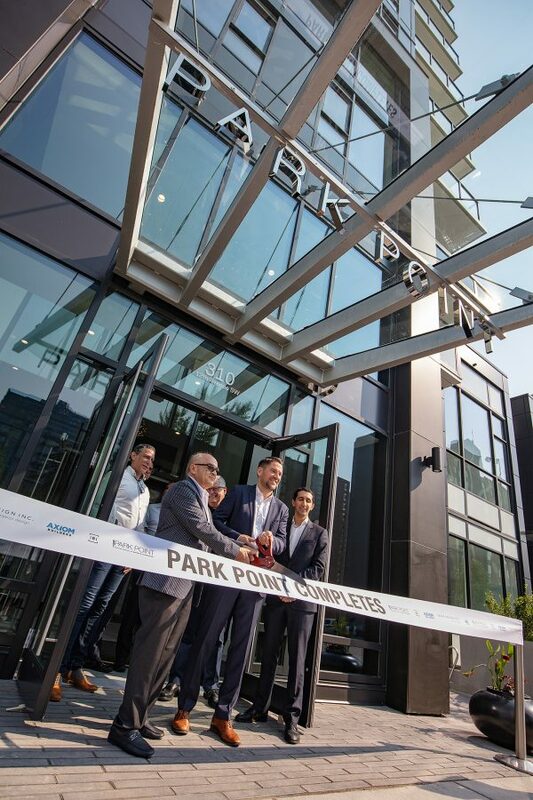 “Our plan for the project has always been to deliver a luxurious residential community that integrates modern living with great amenities and city access to allow residents to create a work, live, play lifestyle,” says Esfahani.The opening of Park Point is the next step in Qualex-Landmark’s plans to redefine the downtown Calgary skyline and city lifestyle. Responsible for the construction of more highrise residential communities in the beltline than any other developer, Qualex-Landmark group projects account for almost half a billion in real estate value with over 1,300 homes in the beltline in the last 12 years.With final homes now selling, an opportunity to join this unique residential community with an unbeatable park-side view and cityscape is still available.